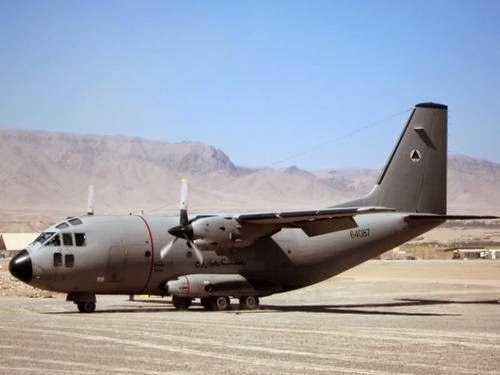 Sixteen unusable transport aircraft that the U.S. government bought for the Afghan Air Force have been scrapped for pennies on the dollar, according to the Special Inspector General for Afghanistan Reconstruction. All told, the Defense Department spent $486 million for 20 G222 planes, of which 16 were sold as scrap to an Afghan construction company for about $32,000, the office announced Thursday in a news release. The remaining four planes are being stored at Ramstein Air Base in Germany. The Air Force let the contract for the planes with Alenia Aermacchi North America expire in March 2013 because the planes were often grounded due to a lack of spare parts. After flight operations ended, the 16 planes in Afghanistan sat on the tarmac at Kabul International Airport until they were recently scrapped by the Defense Logistics Agency and sold for 6 cents per pound of scrapped material, wrote John F. Spoko, special inspector general for Afghan Reconstruction, in an Oct. 3 letter to Air Force Secretary Deborah Lee James. "I am concerned that officials responsible for planning and executing the scrapping of the planes may not have considered other possible alternatives in order to salvage taxpayer dollars," Spoko wrote. Spoko has requested from the Air Force all documentation related to the decision to scrap the planes, including whether any alternatives were considered and what will happen to the four remaining planes. He also wants to know if the Air Force has taken any action against the companies responsible for building and maintaining the planes and if the service made any efforts to return the planes for a refund. The 16 G222 aircraft were scrapped "to minimize impact on drawdown of U.S. forces in Afghanistan," a Defense Department spokesman said.